To arm/disarm multiple areas, enter a [code] that has arm/disarm authority for ALL of the areas to be armed/disarmed. The following display will appear on the LCD screen. The numbers on the top line represent the disarmed areas to which this code has access. The numbers on the bottom line represent the areas that are armed. The following table describes the possible conditions of an area. Ø To arm all of the areas, press the [–] down scroll key. Ø To disarm all of the areas, press the [•] up scroll key. Ø To toggle the condition of a single area between armed and disarmed conditions, press [s] [Number of Area]. For example, If Area 4 is armed; [s]  will disarm Area 4. If Area 4 is disarmed, [s]  will arm it. Enter a code that is a valid arm/disarm code for the area you wish to operate. The following display will appear on the LCD screen. Only the areas authorized by this code will appear. Ø To toggle between the armed and disarmed states of an individual area, press [s] [Area number]. Ø To operate an individual area, enter the number of the area desired. The LCD code pad will now operate as a single area code pad. All keys and functions entered will affect this individual area only. The lights and display represent the status of that area only. The word “System” will be replaced with the word “Area #”. The following is an example of this feature. To exit this screen, press [#]. Area 5 is selected and Area 5 is ready to arm. To exit the individual area mode, enter [#] [#]. If the code pad is sounding an alarm or the siren is running, it can be silenced by entering a code with the authority for the area(s) that are in alarm. NOTE: The [EXIT], [BYPASS], and Alarm Memory [s]  function keys will only work if an individual area is selected. 1. Press [*]  to display the zone(s) on the code pad that created the last alarm. 2. The LCD Screen will display the zone description for those zones. 3. Press [#] to exit the alarm memory. The NX-16 has a 185 event log that can be retrieved using a master code. This log contains a listing of the last 185 events along with date, time, and partition where the event occurred. 1. To view the log, press [*]  . The LCD screen will prompt you for a code. 2. Enter your [master code]. The LCD screen will now show the most recent event. 3. To view the events from most recent to the oldest, press the [–] down scroll key. 4. To view the events from the oldest to the newest, press the [•] up scroll key. Ø The display contains the following information. Example shows an opening of Area 3 on September 25 at 5:57 p.m. by user 75. The [*] shows that this event is not programmed to be reported to the central monitoring station. The door chime is turned on or off by pressing the [CHIME] key. Enter the reset function [s] . 1. Enter The LCD Screen will prompt for a code. [r]  . 2. Enter [Master code]. The time and date will be displayed with the current hour flashing. 3. Use the [•] [–] scroll keys to select the proper hour. 4. Enter the [r] key to move to the minutes, day of week, date, month, and year. 5. Repeat Steps 3 and 4 until the entire time and date are set. If programmed, this function will perform a battery test, communicator test, and/or a siren test. No alarms will be sent, and no reports will be sent unless a communicator test is performed, in which case a test signal will be sent. 1. Press [r] . The test will be performed as programmed. 2. If the siren test is performed, enter a [user code] to silence the siren. 2. Enter a [Master Code]. Ø Now all zones become 24 hour, silent, and local (non-reporting zones). Ø By faulting any zone, that zone will latch its zone light on the LED code pad, and sound the Chime. Ø The Chime will continue to sound each time a zone is faulted. 3. Once all zones are tested (zone lights lit on the LED code pad), enter a [Master Code]. The following message will be displayed periodically if the security system requires service. If you see this display, press [*]  . One or more of the following fault messages will be displayed. Use the [<] [>] scroll keys to browse through them. To exit the service messages, press [#] [#]. A short circuit of a control’s power supply has occurred. Open circuit has occurred on the bell or siren circuit. (Optional) The Box Tamper circuit has activated. The phone line connected to the control is not operating properly. The control attempted to communicate a message to the Central Station, but was unsuccessful. A short to ground has been detected on a control circuit. Your system has lost total power and needs the clock reset. The main power to your system is not on. The standby battery is low. A short circuit of an expansion devices’ power supply has occurred. An auxiliary reporting device has failed to communicate. The main power to an expansion power supply is not on. An expansion power supply has a low battery. A box containing an expansion device has been opened. An expansion device or code pad is not reporting to the control panel. Open circuit has occurred on the bell or siren circuit of the expander. A zone is tampered. Press [*] to identify the tampered zone. A wireless device has a low battery. Press [*] to identify the zone. A wireless or multiplexed zone device is not reporting to the control. Press [*] to identify the zone. A zone is experiencing some form of trouble (probably wiring). Press [*] to identify the zone. Ø Beeps for all key presses. Ø Sounds a continuous tone during the Entry delay time. Ø Pulses when a day zone is violated while the system is disarmed. Ø Pulses when a FIRE zone has a trouble condition. Ø Pulses when the armed status changes and the AC power is off. Ø Beeps 3 times for trying to arm with the “READY” light off, if “FORCE ARMING” has not been selected. Ø Beeps 1 second for the “CHIME” feature. Ø Beeps 1 second at the end of the exit delay. Ø Beeps to indicate telephone line fault if selected. Ø Beeps 1 long beep followed by 3 short beeps to alert you that there are only ten seconds remaining in the exit delay. 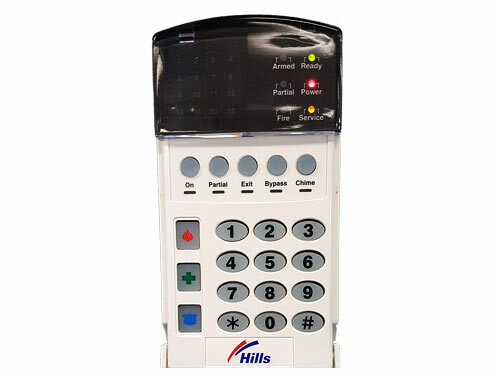 When pulsing, the keypad sounder may be silenced by entering a valid [User code]. The arm/disarm state of your system will not change when entering a code to silence a pulsing keypad sounder. Armed Light: The armed light is “on” when the system is armed. The armed light is “off” when it is disarmed. The armed light will flash when there has been an alarm during the previous arm cycle. Bypass Light: The bypass light is “on” when any zone in this code pad’s area is bypassed. The zone(s) that is bypassed will also be illuminated. If the bypass light is “off”, no zones are bypassed. Chime Light: The chime light is “on” when the chime feature is “on”; “off” otherwise. Fire Light: A steady fire light means a fire zone has been faulted. A rapidly flashing fire light means that a fire zone is in a trouble condition. On Light: The on light is “on” when the system is armed. The on light is “off” when it is disarmed. Partial Light: The partial light is “on” when the system is armed in the Partial Mode. All non bypassed zones will be delayed and follow the Partial delay time. When armed in Partial Mode, the Arm, On, and Bypass lights will also be “on”. Power Light: The power light is on if the primary power is on. The power light will flash if the system has a low battery condition. Ready Light: The ready light is “on” when the system is ready to arm and “flashes” if ready to force arm. The ready light is off when the system is not ready to arm because of a zone(s) being faulted. Ø ARMED will illuminate if ALL areas are armed. Ø READY will illuminate if ALL areas are “Ready”. The ready light will flash if all areas are Ready or Force arm-able. Ø FIRE will illuminate if ANY one area has a Fire condition. The fire light will flash if ANY area has a Fire Trouble condition. Ø POWER will illuminate if the primary power is connected to the NX-16 control panel. It will flash if the system has a low standby battery condition. Ø PARTIAL will illuminate if ANY area has the partial light on. Ø CHIME will illuminate if ANY area is in the “Chime” mode. Ø EXIT will illuminate if ANY area is timing an exit delay. It will flash if ANY area is in the last 10 seconds of an exit delay. Ø BYPASS will illuminate if ANY area has a zone bypassed. Ø SOUNDER will sound if ANY area has the sounder on. This includes Entry delay, Exit delay, Chime, and Alarm. 1. Press [s] . The LCD Screen will prompt for a code. 2. Enter [Master code]. The LCD Screen will prompt for a user number. Ø For partitioned systems, if you are changing the code of another person, you must have access to all partitions, or at least all of the partitions to which the other person has access. 3. Enter the 2 digit user number (always 2 digits, i.e. for user 3). Ø The LCD screen will prompt for a new code. 4. Enter the new [user code] designated for that individual. If it rejects the code because of a duplication or such, the sounder will beep 3 times. 5. If another user code needs to be programmed, return to step 3 and enter the user number. 6. To exit Code Programming, press [#] while the LCD screen is prompting for a new user. 4. Press [Chime] [Chime] [Chime] [Chime] for a 4-digit code or [Chime] [Chime] [Chime] [Chime] [Chime] [Chime] for a 6-digit code. 5. If another user code needs to be deleted, return to step 3 and enter the user number. Ø You must have authority to the partition you wish to add or remove from another person’s authority. Ø The LCD will now prompt you for the attributes in the following chart. Outputs used? » DO NOT CHANGE THIS SEGMENT! Your key-press will apply to the user code you entered in Step 3. Output 4 ? If these messages appear on the LCD screen, press the [r] key until you return to the prompt for the user code or until you exit this adjust mode. 4. The LCD will now display all of the partitions to which this user has access. If you wish to remove a partition, press the partition number on the code pad, and the display will mark that partition with a (-) hyphen indicating access has been removed. If you wish to reestablish user access to the partition, press the partition number again. 5. Press [s] to save the data. The LCD will then prompt you for the next user code. 6. If another user code needs to be programmed, return to Step 3. If not, press [#] to exit this feature without saving the data.